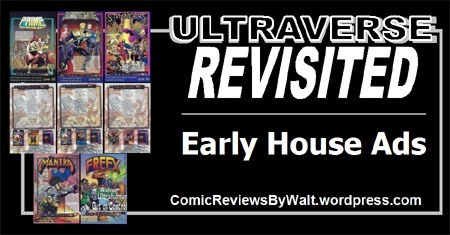 Here are several early "house ads" for the first few Ultraverse titles, plus the "Ultratorials" from Prime, Hardcase, and The Strangers #1s. 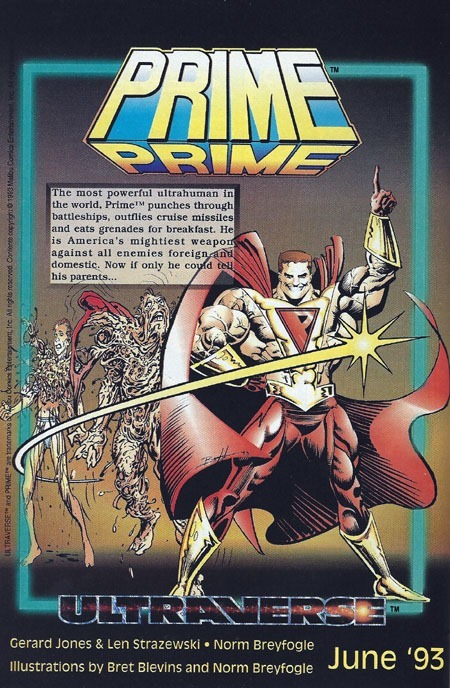 For me, one of the most noticeable differences from ad to print with Prime was the title logo–the lower portion was removed, and the cover of the first issue features only the full, heroic Prime–not the two-stage transformative part next to it. The text description sorta fits what I remember, in the "hype" sense, but doesn’t feel entirely accurate on the first issue in particular. 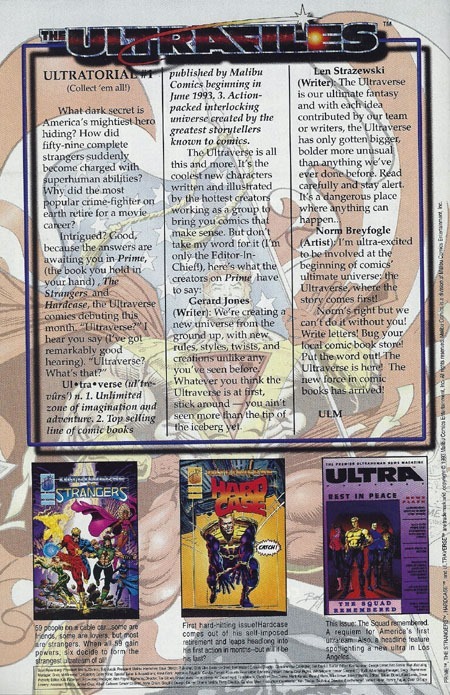 This Strangers ad is the image for the first issue’s cover, and offhand seems like what was printed, albeit with some different coloring, perhaps. 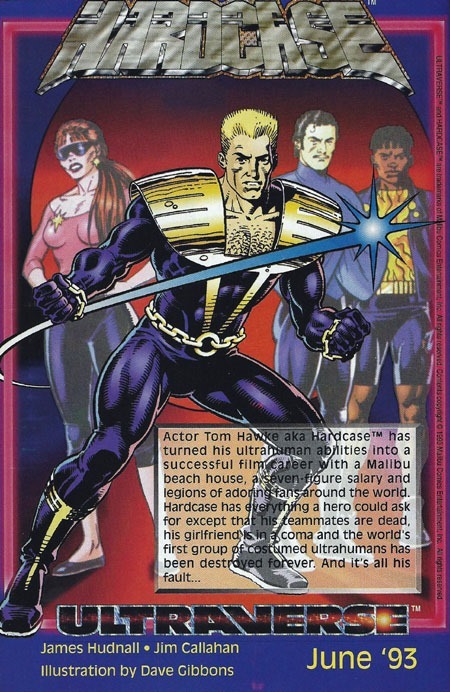 And with Malibu‘s coloring department (long-rumoured to have been why Marvel bought the company) it makes plenty of sense to me offhand that that would make for some simple changes, and the coloring (of the background) can make an image look at once familiar yet suitably different like this. The text definitely fits, though sorta "gives away" the "lost city" bit…but had you asked me before looking at/reading this ad, I would have been able to tell you essentially the rest of it, just not "…with a sorceress from a lost city…"
I feel like Hardcase was another logo that changed between ad and print, with a more "basic" and bigger/blockier design. 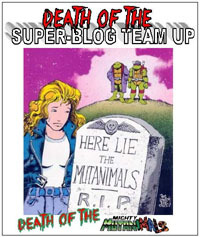 This logo is familiar enough that I want to say it got used on later issues of the series. 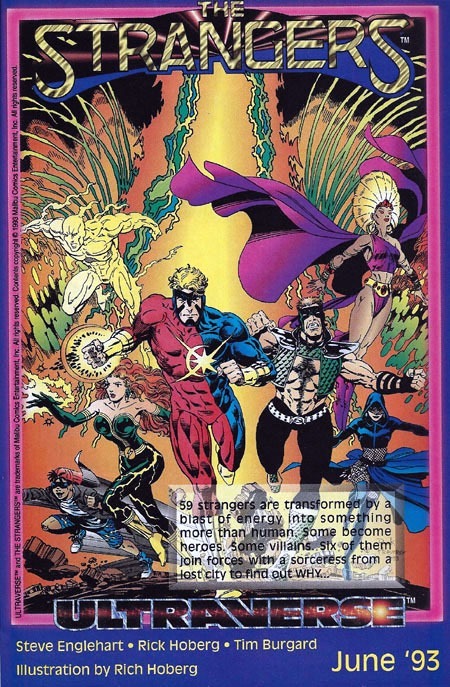 This image is completely different from the first issue’s cover, though 25 years later, this would simply be a case of "I didn’t get the variant cover." I like the image in terms of the ad, but it would seem rather boring and "off" to me for what I recall of the first issue itself. The text piece mostly gives the premise of the series, but I wonder (now) about the timing of stuff for what I recall of the character only having a year "off" from super heroics–is that really time to build a huge film career? 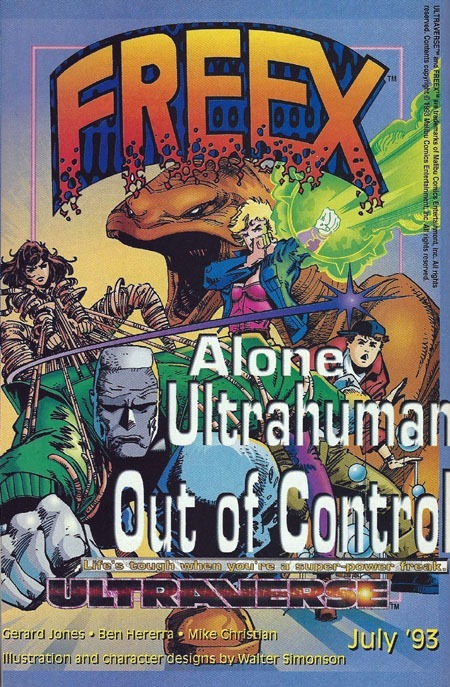 I like this Freex ad–it’s the image I associate with the first issue, and I think I even have a poster of this. I prefer the text being part of the image, rather than a Microsoft Word "text box" dropped onto the image…it feels a lot more dynamic…and memorable! I do notice a small "text box" but even that seems a bit fancier than the first three ads, and actually does NOT stand out so much. "Life’s tough when you’re a super-power freak." Mantra is another where the image from the first issue’s cover is used, which I definitely like! The text box seems a bit much, with two ‘paragraphs’ of premise given…it makes it look a bit more complicated. Of course, I like that this info is provided, as it beats the heck outta just simply giving the image and saying "blindly buy me!" It also somewhat spoils developments in the first couple issues, and as I recall, technically "spoils" the first issue’s cliffhanger. 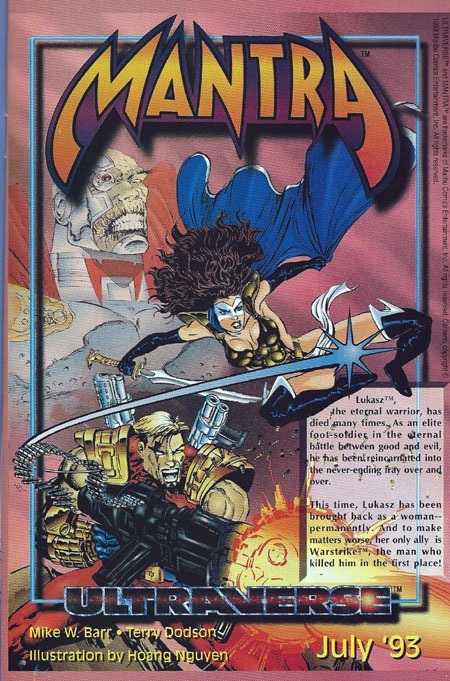 Additionally, for a "solo title," the cover makes it look like a bit of a team-up book, with Mantra and Warstrike fighting together, and possibly for the shadowy guy in the background (the villain Boneyard). The main character is the smallest figure on the image! Here’s the "Ultrafiles" page from Prime #1. 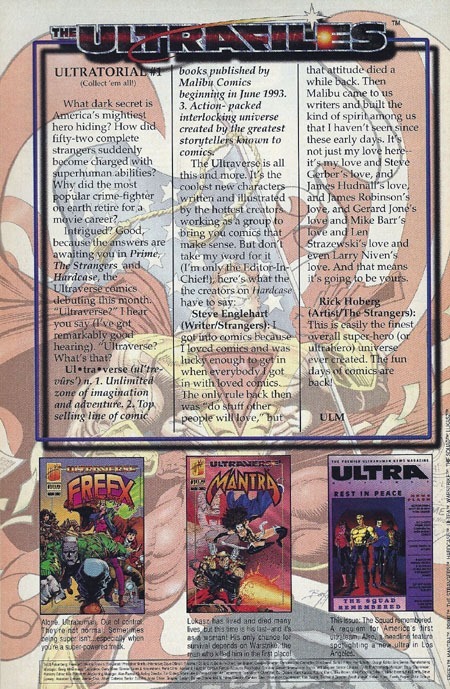 While I the first part is the same across the several issues, the latter part is changed up to fit the specific issue, with small quotes from the creators of the specific issue. …and here’s the page from Strangers #1. 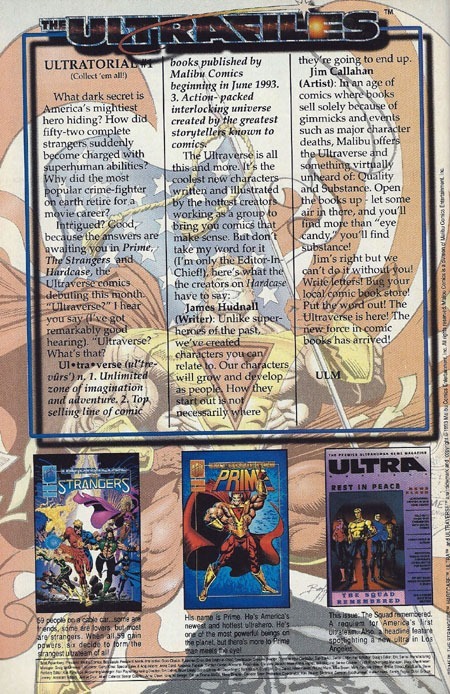 Though I’ve been almost certain that Strangers had been the first of the titles out (granted, this was 25 years ago and I was a 12-year-old kid at the time), that its page showed the covers of the next month’s new #1s has me slightly doubtful. Regardless, I appreciate that these pages were changed to fit the specific issue–they were not just a one-size-fits-all static thing inserted into each issue. This is also from a time when the "primary" cover was what was marketed–not the variants. Variants existed–specifically full-cover holographic covers, and versions with silver foil logos–but they were not the marketed versions. They were special "additional" versions! The hologram images I’ve come to learn were actually different from the printed art; but the foil editions are the same exact cover, just with the bulk of the logo as silver foil. The hologram covers are extremely distinctive–you’d know EXACTLY what you’re looking at to see one; and otherwise, the marketing (like these pages and most of the house ads) show you exactly the cover image you’re looking for, on whichever series! Two and one half decades later, and going through back-issue bins, one can immediately tell what issues are what and the (series) reading order and all that.